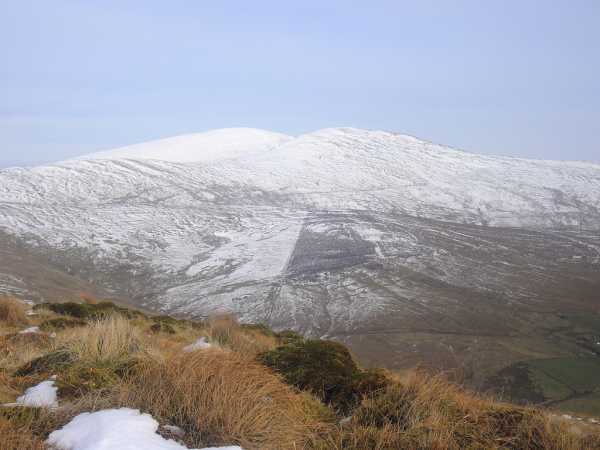 Mullaghclogha is the second highest mountain in the Sperrin Mountains area and the 229th highest in Ireland. Mullaghclogha is the second highest point in county Tyrone. Continued from Mullaghasturrakeen entry, this walk takes in the two highest peaks of 'the Mullaghs' in a circular route starting from a parking spot at 543927 E. From the latter's summit, the route to Mullaghclogha is apparent enough: simply follow the fenceline down and up again to the higher peak. Normally this would be a typical enough slog over boggy ground, but progress was hampered by the deep snow. Thankfully though, it wasn't as tough going here and I stayed close to the fence for the most part, venturing out a little where the ground was easier to negotiate beyond. The summit, once again, was an uninspring meeting if fences - quite disappointing really seeing as this is the second highest summit in the range and the highest peak in Tyrone (if not its highest point - that belongs to a spot just south of the summit of Sawel). The view now included Dart and Sawel to the W, various other peaks on either side of the Glenelly Valley such as Carnanelly and Mullaghsallagh and NE to Benbradagh near Dungiven. I had a quick lunch in the slight shelter of the fence junction then set off again. I could've retraced my steps: down and up again to Mullaghasturrakeen, then back down to the parking spot, but the thought of braving waist-high snow again on the latter mountain was too much. In any case, I always prefer taking a different route back. I therefore followed the fence that headed SE towards the valley, even though this would involve a long road walk. This was straightforward enough, just beware of stray wire close to the bottom of the fence. This side was also a little rockier than the one I'd ascended. As I descended I could clearly see the distinctive yellow(ish) chapel in the village of Cranagh.